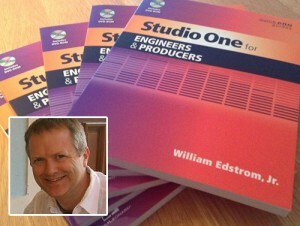 Bill Edstrom, and Why He Chose to Write a Book on Studio One. When I started talking to Bill Gibson at Hal Leonard about some book concepts, I really wanted to do a Studio One book. I think they see the potential for this DAW because they have already published Larry the O’s book Power Tools for Studio One with a second volume on the way. My book is designed as concise introduction to the core features of Studio One. I wrote it for the person that already has some experience with another DAW. The book content is really focused on getting up to speed with the software as quickly as possible. There are also 12 new videos included with the book covering some of the key concepts that would be tricky to explain in writing. Why Studio One? Well, besides being great software, PreSonus has been amazing to work with. I have had the chance to meet Matthias and the PreSonus Software team at PreSonuSphere and NAMM and they have been very welcoming. The rest of the PreSonus team including Rick, Jonathan, Brad, and Jim have been friendly and great hosts in Baton Rouge. I also really enjoyed presenting to a group of Studio One enthusiasts as part of PreSonuSphere 2012 last year. At first, I was recording with Studio One as a canvas for creativity. But I realized that I could produce music end to end without really needing to use other tools. Back in March 2010 I put together my first rather crude Studio One video called “Fun With PreSonus Studio One.” That video has 42,000+ views. I think the title sums up my experience with Studio One. It’s fun to use!